There's something freeing about being able to move furniture around quickly and easily. It's the same with portable floor lamps and table lamps. Their mobility is a huge benefit when moving around or redecorating to express a newly discovered design scheme. They can immediately change the look of a room without having to rewire or punch a hole in the wall. 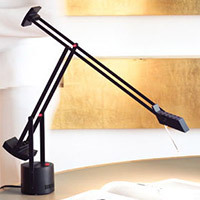 Floor lamps are especially great when it comes to adding ambient lighting, while table lamps help immensely when it comes to reading or task work at the desk or couch. Floor and table lamps are able to find their home in a number of rooms, thanks in part to their versatility and portability. You'll find a modern floor lamp or table lamp will work well in the living room, providing task and ambient lighting where ceiling lights and wall sconces might not spotlight a particular area, like near a couch or in a far corner. They're also great for bedroom lighting, especially when two lamps are used on either side of the bed atop your nightstands. If you don't have a reading sconce in the bedroom, you'll find a table lamp will offer a similar amount of helpful, task-oriented light. Plus, table lamps on either side of the bed means individual lighting control and one happy couple. Table lights are especially great for the office or den, providing adjustable task illumination so you don't get a headache from eye strain. Finally, in the dining room or placed near the front door in the entry, you will like the functional and decorative presence of a console lamp. 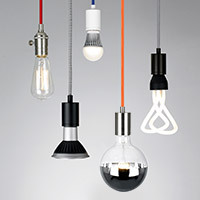 This collection of portable lighting is designed to fit a wide variety of interior design styles, ranging from traditional rooms to spaces with the most modern of decor. Classic table and floor lamp styles include bronze and polished nickel lamps by George Kovacs, as well as the wrought-iron lamp designs by Hubbardton Forge. Contemporary homes benefit from the transitional lamp options by Robert Abbey and look to Artemide or Flos Lighting for an ultra-modern floor lamp, table lamp or desk lamp. 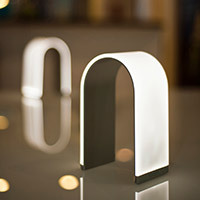 Finally, if you love energy efficiency in your home, be sure to check out the LED-infused lamps from Marset. When it comes to choosing a floor or table lamp, you will want to consider the size of the lamp and how it will fit into your room. In large living areas like a great room or open living room, the space will benefit from the inclusion of an arc floor lamp or multi-arm lamp. Conversely, smaller bedrooms and offices will require much more proportionate options like a slim desk lamp or pair of small table lamps. 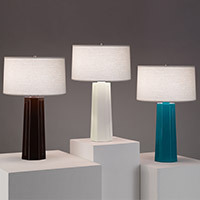 When browsing for a new lamp, be sure to view its sizing dimensions to get the best idea of the fixture's width, diameter, length and weight before purchasing. You can also review the lamp's light source options and if you plan to take the fixture outdoors, verify it is UL listed for wet or damp locations. If you have any questions about the floor and table lamps featured here, please call our lighting experts at 877.445.4486. 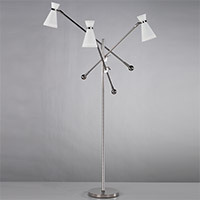 You’ll love torchiere floor lamps. They provide the best of both worlds--ambient lighting and adjustable task lighting--all in one fixture. Uplight floor lamps and torchiere lamps are ideal in living rooms, where you want a decent amount of general, ambient light, as well as focused light for catching up on your favorite book. And if you love the portability and versatility of these lamps, you may enjoy the same benefits in a wall lamp -- check out the selection of plug-in wall lights for options that simply plug-in to the nearest power outlet and can be re-arranged at a moment's notice. 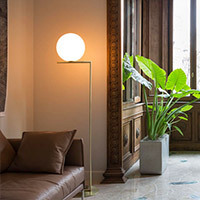 The Justice Design Domus Apollo Floor Lamp sports a delightful combo of sophistication and inimitability that lends a modernistic flair to every room. The Domus Apollo Floor Lamp features polycarbonate shade, wooden body and Beech Wood finish.